China may struggle to enforce new fishing rules issued to restrict fishing by foreign vessels in disputed areas of the South China Sea. On China's southern Hainan island, a fishing boat captain shows a Reuters reporter around his aging vessel. He has one high-tech piece of kit, however: a satellite navigation system that gives him a direct link to the Chinese coastguard should he run into bad weather or a Philippine or Vietnamese patrol ship when he's fishing in the disputed South China Sea. By the end of last year, China's homegrown Beidou satellite system had been installed on more than 50,000 Chinese fishing boats, according to official media. 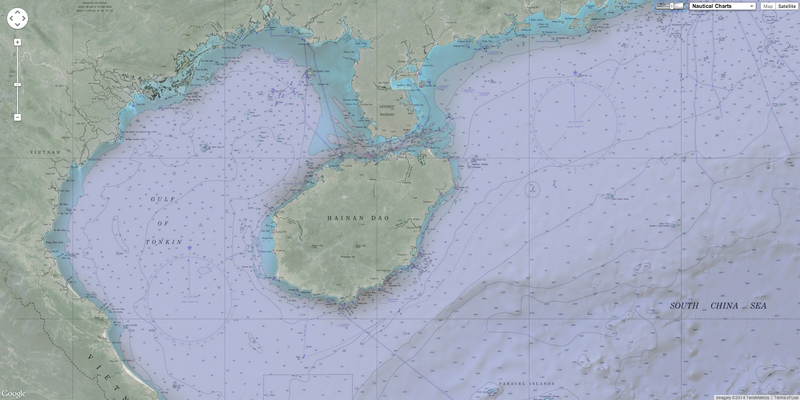 On Hainan, China's gateway to the South China Sea, boat captains have paid no more than 10 percent of the cost. The government has paid the rest. 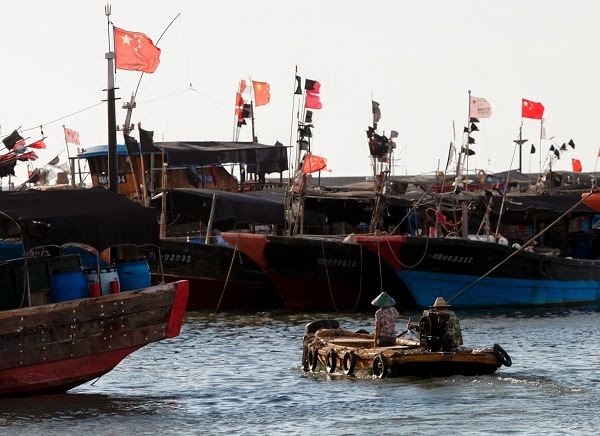 China has a lot of fishermen—with 695,555 vessels, its commercial fishing fleet is more than double the size (pdf, pg. 36) of the next biggest, from Japan. That’s primarily because China eats a lot of fish per capita, and catches more fish than any other country in the world by a huge margin. It's a sign of China's growing financial support for its fishermen as they head deeper into Southeast Asian waters in search of new fishing grounds as stocks thin out closer to home. Hainan authorities encourage fishermen to sail to disputed areas, the captain and several other fishermen told Reuters during interviews in the sleepy port of Tanmen. Government fuel subsidies make the trips possible, they added. That has put Chinese fishing boats - from privately owned craft to commercial trawlers belonging to publicly listed companies - on the frontlines of one of Asia's flashpoints. Most recently, they were a fixture around a Chinese oil rig positioned in disputed waters off Vietnam, where they jostled and collided with Vietnamese fishing boats for more than two months until China withdrew the drilling platform in mid-July. 50,000 Chinese fishing boats are now equipped with a satellite navigation system, this system gives the fishermen a direct link to the Chinese coastguard in case of bad weather. This new system can also show when a Philippine or Vietnamese patrol ship is nearby, helping the fisherman go further into the South China Sea. Explanations for China's assertiveness in the South China Sea usually focus on the strategic significance of the waterway, through which $5 trillion in ship-borne trade passes each year, or Beijing's goal to increase its offshore oil and gas output. Rarely mentioned is the importance of seafood to the Chinese diet, several experts said. A 2014 report by the Food and Agriculture Organisation (FAO), for example, said China's per-capita fish consumption was 35.1 kg in 2010, nearly double the global average of 18.9 kg. "Fish products are just so critical to China's way of life. I think this is something most people haven't factored into the equation when they've looked at these conflicts and disputes," said Alan Dupont, a professor of international security at the University of New South Wales in Australia. "It's pretty clear that the Chinese fishing fleet is being encouraged to fish in disputed waters. I think that's now become policy as distinct from an opportunistic thing, and that the government is encouraging its fishing fleet to do this for geopolitical as well as economic and commercial reasons." With 16 Chinese satellites in orbit above the Asia-Pacific at the end of 2012 and more planned, the 19-month-old Beidou system is a rival to the dominant U.S. Global Positioning System (GPS) and Russia's GLONASS. China's military is already a big user of Beidou, or Big Dipper. It's unclear how often Chinese fishermen use Beidou to seek help. None of the fishermen Reuters interviewed in Tanmen said they had sent a distress call. But fishermen could use the system to alert authorities if they had mechanical trouble or had a run-in with foreign maritime agencies, Chinese official media has said. The push of an emergency button sends a message straight to the Chinese authorities, which because Beidou actively transmits location data, could pinpoint the exact whereabouts of a vessel. Beidou's unique short messaging system also allows users to communicate with other fishermen, family or friends. When Philippine authorities boarded a Chinese fishing vessel in May in a contested reef in the Spratlys, one of the region's main island chains, they quickly turned off the Beidou system, China's official Xinhua news agency said at the time. A senior Philippine police official disputed that report, saying the boat had no satellite tracking device. Nine Chinese fishermen from the boat are awaiting trial in the Philippines for catching endangered turtles. Zhang Jie, deputy director of the Hainan Maritime Safety Administration, a government agency, said he did not have accurate information on Beidou usage but added that fishermen were encouraged to fish in any waters that belonged to China. At the same time, Zhang told Reuters he did not believe the government wanted them to seek conflict with other countries. Other authorities in Hainan, such as the provincial fisheries office and the bureau which enforces fishing regulations, did not respond to requests for comment. Nor did the China Satellite Navigation Office, which runs Beidou. The Foreign Ministry along with the State Oceanic Administration, which has overall civilian responsibility for maritime affairs including the coastguard and fishing vessels, also did not respond to requests for comment. Since President Xi Jinping took power in March last year, Beijing has increasingly flexed its muscles in the South China Sea. China claims 90 percent of the 3.5 million sq km (1.35 million sq mile) waterway, with the Philippines, Vietnam, Malaysia, Brunei and Taiwan also claiming parts of the ocean. China sent its sole aircraft carrier through the South China Sea for the first time in late 2013 while its coastguard has sought to block the Philippine navy from re-supplying a military outpost on a reef claimed by Manila in the Spratlys. While some of China's actions have alarmed other claimants and drawn criticism from Washington, such as the placement of the oil rig off Vietnam, China says it has every right to conduct what it calls normal operations in its waters. Only weeks after becoming president, Xi made what state media called a surprise visit to Tanmen, where he told fishermen the government would do more to protect them when they were in disputed waters. Xi never elaborated, but a huge billboard near the port commemorates his visit, showing a picture of the president flanked by grinning fishermen with trawlers in the background. Several fishermen from separate boats said the Hainan authorities encouraged fishing as far away as the Spratlys, roughly 1,100 km (670 miles) to the south. The boat captain said he would head there as soon as his vessel underwent routine repairs. "I've been there many times," said the captain, who like the other fishermen declined to be identified because he was worried about repercussions for discussing sensitive maritime issues with a foreign journalist. Another fisherman, relaxing in a hammock on a boat loaded with giant clam shells from the Spratlys, said captains received fuel subsidies for each journey. For a 500 horsepower engine, a captain could get 2,000-3,000 yuan ($320-$480) a day, he said. "The government tells us where to go and they pay fuel subsidies based on the engine size," said the fisherman. Added one weather-beaten captain: "The authorities support fishing in the South China Sea to protect China's sovereignty." To be sure, they have other reasons to make the journey. A study by the State Oceanic Administration said in October 2012 that fish stocks along the Chinese coast were in decline. "Right now I would say competition for fishing resources is the main cause of tensions between China and regional countries," said Zhang Hongzhou, associate research fellow at the S. Rajaratnam School of International Studies at Nanyang Technological University in Singapore. At least one big Chinese fishing company is also flying the flag in disputed waters and benefiting from government assistance. In late February, Shanghai-listed Shandong Homey Aquatic Development Co Ltd, which has annual seafood sales of $150 million, announced the launch of eight new 55-metre long (180-ft) trawlers from the port city of Dongfang on Hainan. On its website, it said the move was a "response to the government's call to develop the South China Sea and safeguard national sovereignty". Six weeks later, the Dongfang city government said Shandong Homey would get 2 million yuan ($322,500) for each boat in "renovation" grants, according to its website. Dongfang officials declined to comment. Shandong Homey might need the money for repairs. In late May, Vietnam's government accused a Chinese trawler of ramming and sinking a small Vietnamese wooden fishing boat near the Chinese oil rig in an incident captured on video. China said the Vietnamese boat was being aggressive. While footage of the May 26 incident is too blurry for the naked eye to determine the number on the Chinese ship's hull, Vietnam's coastguard said it was #11209. Dang Van Nhan, 42, the captain of the sunken boat and who was rescued along with nine crew, told Reuters during an interview in the coastal Vietnamese city of Danang that it was #11202, saying he got a clear look. The Dongfang city government website lists vessels #11209 and #11202 and six others as Shandong Homey's eight new boats. In the Dongfang harbor, several Shandong Homey boats lay anchored including vessels #11209 and #11202. Both have the same features as the trawler in the video. Shandong Homey declined telephone and email requests to comment. One crew member at the port said the fleet returned to Dongfang in early June but then refused to say anything more. Several Shandong Homey employees later surrounded a Reuters reporter and demanded to know why he was asking about the boats. They then turned him over to police, who briefly detained him.